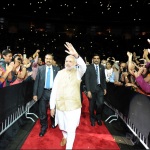 As Prime Minister Modi departed the SAP Center in San Jose, California on 27 September, there was almost an expectation to hear an announcement with his 2016 American Tour Dates – “tickets going on sale soon for shows in Los Angeles, Chicago, Houston and Atlanta”. It is the only thing separating Modi from Indian film industry’s touring stars. During his five day trip to the U.S, he didn’t accomplish much, but continued to build relationships with his two largest constituencies– corporate America and Indian-Americans. Modi understands, as a leader and as a politician, that the support of these groups (through the trials and tribulations of the economic reform process in India) is critical to maintaining India’s momentum and attracting global investment. In New York, Modi sat down with Fortune 500 CEO’s, the top media companies, and with Wall Street titans. In each case, the meeting was to reassure them of his commitment to economic reforms. The Fortune 500 is committed to India in the long-term because of its huge market. Even in the most frustrating times, they will not give up on India, but simply shift their focus elsewhere. Modi’s visit was to reassure them that he is doing his best to take advantage of this moment in history, where he has a majority, public support and an economic agenda that global business likes. Although he has not been able to deliver on reforms like the Goods and Services Tax or land bill, he needed to reassure financial investors and corporate leaders that the vision had not changed. In Silicon Valley, his meetings with technology executives and entrepreneurs was similarly meant to transfix their gaze on India. Modi positioned himself as tech-savvy – bantering with Mark Zuckerberg of Facebook and Elon Musk of Tesla Motors — as if he was about to don a hoodie. He positioned his administration as one that understands the role of technology in advancing society – not just for the interests of India’s IT companies, but more broadly to provide services, connect communities and create value. Less than 1% of India’s population can afford a Tesla. So the point of meeting Elon Musk was not to promote Tesla sales in India – it was to showcase India as a nation poised to adopt cutting-edge technology and innovation to promote the common welfare. Visits to Facebook and Google similarly showcased Modi as someone who understands what access to information and connectivity can do for the human condition. The second constituency to address was the Indian-American community. Narendra Modi has had a concerted and strategic effort to engage the global Indian diaspora in an unprecedented way. His remarks tugged at their heartstrings and played to their nationalism. He spoke to them as Americans but implored them to not forget their country of origin. He laid out his agenda as one that creates opportunities for Indians that are similar to those that NRIs receive – access to a high quality American education, good health care, technology and the ability to live without corruption. This resonated with the guilt that NRIs feel for having left India. Historically, the diaspora has been a dilemma for Indian politicians. While these emmigrants maintain deep cultural, familial and business ties to India, they have been hesitant to mobilise on India’s behalf. For Indian-Americans, it has been particularly hard, as the interests of the U.S. and India have rarely aligned in the past. But here again, Modi is different. He has spent time with the Indian diaspora. He has stayed at their homes all over the U.S. He purportedly is a fan of American Tex-Mex cuisine (vegetarian nachos in particular). He knows that his right-wing allies in India – the VHP, BJP and others, have large organisations in the U.S., Great Britain and Canada. Although Modi did spend this visit announcing new programs like the Sustainable Development Goals (SDGs) at the UN and the push for ‘Digital India’ in Silicon Valley, he had no discussion on the progress of Swachh Bharat, ‘Make in India’, or Jan Dhan Yojana, Aadhar and Mobile (JAM) initiatives. It was fine for this trip, but it won’t be acceptable next year. The diaspora hopes tickets to see PM Modi next year do go on sale. That will be an appropriate time to visit Chicago, the heart of American manufacturing, to talk about the progress of “Make in India” and Houston, the world’s energy capital, to talk about India’s growing self-reliance in energy and impressive commitment to climate change elimination. On both counts, there must be progress to talk about. Only then will the diaspora stand across from him with their commitments, and fertilise the blossoming India-U.S. relationship. Nish Acharya is a Visiting Fellow, India-U.S. Studies at Gateway House: Indian Council on Global Relations. He currently leads the Indian Diaspora Investment Initiative with the Calvert Foundation, is a Senior Fellow with the Center for American Progress, and a columnist for Forbes Media. Nish previously served in the Obama administration, where he was appointed by President Obama as the director of innovation and entrepreneurship and senior advisor to the secretary of commerce.